It is the latest trend: connecting objects. Countless organisations are already investing into making their products smart. They use the resulting information to e.g. optimise the efficiency of their processes, save energy or improve usability. But what is the best way to go about this? Which technology should you choose? And how can you use this technology so it gives you the exact information you need? In this series of blog articles, we will offer you valuable information and guidelines related to the Internet of Things. This is part 3: about the LPWAN technologies NB-IoT, LTE-M, LoRa and Sigfox. 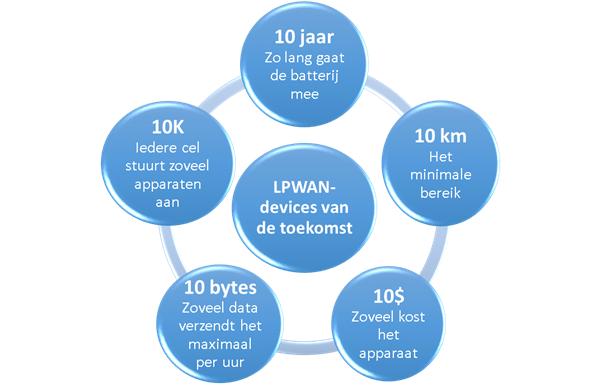 There are several LPWAN-technologies that you can use to connect your product to the internet, so it can communicate with other connected devices. Below, you can read everything about connecting devices via NB-IoT, LTE-M, LoRa and Sigfox. Information is transmitted between battery-powered devices using the wireless LPWAN network. LPWAN is suitable for long-range connections and offers excellent coverage, even in hard-to-reach areas and underground. The downside is its slow data transfer rate. LPWAN utilises advanced energy-saving technology. The three main types of LPWAN are NB-IoT, LoRa and Sigfox. It is important to consider which network is available in which countries. NB-IoT is comparable to LTE (commonly referred to as the 4G network). The technology utilises the advantages of the 4G network: infrastructure, range and security. This technology is characterised by its excellent coverage and wide range, even underground. NB-IoT can connect millions of devices to each other. A downside is the low bandwidth, which means it is not possible to transmit large quantities of data in a short time. On the other hand, the battery will last a long time; up to fifteen years with a usage of 200 bytes per day. The technology makes use of an existing network and licensed frequencies, such as 3G and 4G, which makes it impossible for others to interfere on the network. There is also no legal limit on data usage. NB-IoT was designed to keep the costs per module as low as possible. These costs are expected to drop below $2 per module in the future. Because of its small memory (a cheap PSRAM variant) and its single antenna, NB-IoT is cheaper than cellular M2M. There is no need for full duplex features (transmitting and receiving data at the same time, e.g. as used by a phone to allow you to talk and listen simultaneously). Because this is not required for NB-IoT, the costs are lower than those of 4G. LTE-M, also known as LTE Cat M1, is a variant of the existing 4G networks and it is comparable to NB-IoT. Compared to the other LTE networks, LTE-M is available for a wider bandwidth, although it offers reduced coverage. LTE-M is designed to frequently transmit data at a lower speed than what is common for 4G networks. The advantage of LTE-M is that it can provide real-time information. This technology is currently very popular in the United States. LoRa connects battery-powered devices to each other via a regional, national or global network at a low cost. This does require a network point, like WLAN or cellular M2M. LoRa has a range of 16 kilometres, even in the wilderness and underground. The technology utilises the licence-free ISM network. A downside of LoRa is the possible interference from other users on the network. There is also a legal limit on the data usage: you may not transmit more than 12 bytes per hour. Sigfox can be used to exchange small quantities of data without frequent communication. Sigfox offers a range of 40 kilometres and very low energy consumption. In the stand-by mode, two AA batteries will last for two years. Like LoRa, Sigfox utilises the licence-free ISM network. Others can also use this network for free. This negatively affects the performance of this technology, e.g. by slowing down the data transfer rate. Data usage is legally limited to 12 bytes per hour. NB-IoT, LoRa, Sigfox or LTE-M? Out of these four WPLAN technologies, NB-IoT is currently in the lead. NB-IoT offers better coverage, no limitations to output, the highest download and upload rates (up to ten times higher than LoRa and Sigfox), the longest battery life, a relatively cheap module and exceptional security. NB-IoT also utilises the existing LTE network. Contrary to LoRa and Sigfox, NB-IoT does not require a new network infrastructure made up of gateways, masts and repeaters. LTE-M is comparable to NB-IoT. It offers a larger bandwidth, so you can transmit more data, at the cost of slightly limited coverage. Another advantage of NB-IoT and LTE-M is that there are several LTE network providers, including AT&T and Vodafone. Sigfox and LoRa only have one provider each. Sigfox is a company that developed its own form of LPWAN, while LoRa is supported by the members of the LoRa Alliance. * In certain cases/situations, the examples may also be applicable to other technologies. Download the entire whitepaper Internet of Things: connecting everything.